On Monday, far beyond the orbit of Mars, an alarm clock went off and a robot began the slow process of waking up after a long, cold sleep. The European Space Agency's Rosetta spacecraft is now awake and on final approach to its target, the comet 67P/Churyumov–Gerasimenko, which it will catch up with this May. Rosetta was launched back in 2004 and has spent the last ten years conducting fancy "gravitational slingshot" maneuvers around the Inner Solar System designed to boost its speed. By making a series of close flybys of planets (three of Earth and one of Mars), Rosetta acquired some of their momentum—not unlike how a discus thrower flings a discus to higher speed by imparting a bit of their own momentum as they spin around. The boost to Rosetta's velocity was sufficient to fling it almost to the orbit of Jupiter, about five hundred million miles from the Sun. It was at this point, in 2011, when the solar-powered Rosetta spacecraft went into hibernation, the strength of sunlight at that distance not sufficient maintain full power. 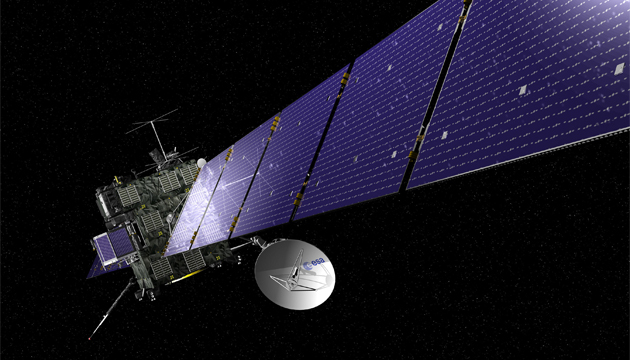 Rosetta's mission in the months ahead will feature feats of comet exploration that have never been done before. Right now Rosetta is over 5 million miles from the comet, but will close the gap to little over a million miles by May. In August, Rosetta will be the first spacecraft to orbit a comet, giving us a much longer close-up look at one of these icy bodies than other spacecraft have achieved on fly-by missions in recent years. Those fly-by missions were exciting and we learned a lot from them, but their close approaches lasted only minutes. Rosetta will spend over a year in close proximity, studying the comet with its 11 scientific instruments—three of which were provided by NASA's Jet Propulsion Laboratory. Even more exciting, Rosetta carries a probe that will be launched sometime in November, and if all goes well will set down and give us the first "boots on the ground" image from the surface of a comet. I'm a junky for otherworldly landscapes, so I'm particularly interested in the returns from Rosetta, and its landing probe Philae. To date we have achieved surface views from only a handful of bodies: the moon, Mars, the asteroid Eros, and Saturn's moon Titan. Comet 67P/Churyumov–Gerasimenko (say that five times fast) orbits the sun every 6.45 years. At the end of its orbit when it's farthest from the sun (aphelion), the comet is farther out than Jupiter, but on closest approach (perihelion) it will be only slightly farther from the sun than we are. Rosetta will accompany the comet as it approaches perihelion in December 2015, giving us a front-row seat to a comet as it heats up. If only a tag-along spacecraft could have followed comet ISON to its perihelion, and demise, last Thanksgiving; what a show that would have been. We've long been interested in comets, not only for the beauty of the rare one that comes close enough to the sun to be seen, but for the fact that comets are preserved specimens of materials from the very early times in the solar system. Think of them as time capsules, or fossils, or ice core samples from ancient ice sheets; the information preserved in their composition and structure can give us insight into the past, when the sun and planets were quite young, four and half billion years ago. Rosetta still has some miles to go before it gets close to the comet, so set your alarm clock for next August when we should wake up to a fresh vision of these ancient and mysterious celestial objects.